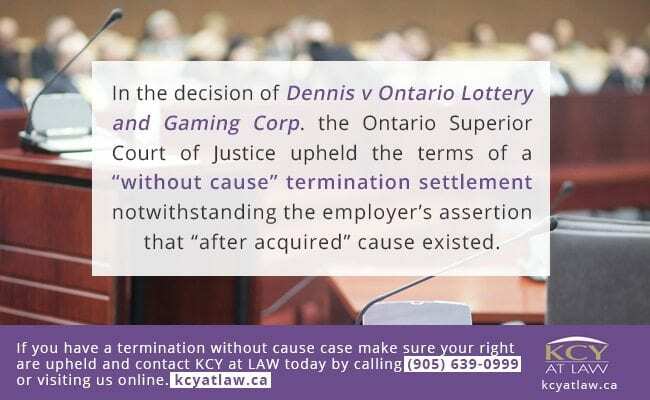 In the decision of Dennis v Ontario Lottery and Gaming Corp. the Ontario Superior Court of Justice upheld the terms of a “without cause” termination settlement notwithstanding the employer’s assertion that “after acquired” cause existed. By way of background, after thirteen (13) years of service, the employee was terminated without cause. 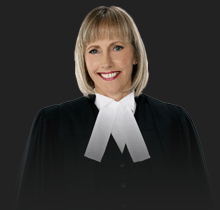 She accepted the terms of a settlement package, which included fifty-three (53) weeks of pay in lieu of notice/severance. Prior to this happening, and while still employed with the employer, the employee was provided with discounted tickets to Canada’s Wonderland to offer the other employees as a part of her job. She was then required to submit the money received from her fellow employees to Canada’s Wonderland. Around this time, the employee was involved in a fraud scam resulting in her using over $1,000.00 of the money owed to Canada’s Wonderland for other purposes. It was the employee’s intention to repay the funds prior to remitting them to Canada’s Wonderland. Following the employee’s termination and receipt of above-noted settlement package, the employer discovered the missing monies. The police became involved in the matter, interviewed the employee and charged her with theft and breach of trust. Eventually, the Crown withdrew the charges against the employee, which the employer was made aware. The employer then conducted an internal investigation into the situation and held that the employee stole the money. As a result, the employer informed the employee it would not be adhering to the terms of the termination package due to having found cause to terminate the employee. 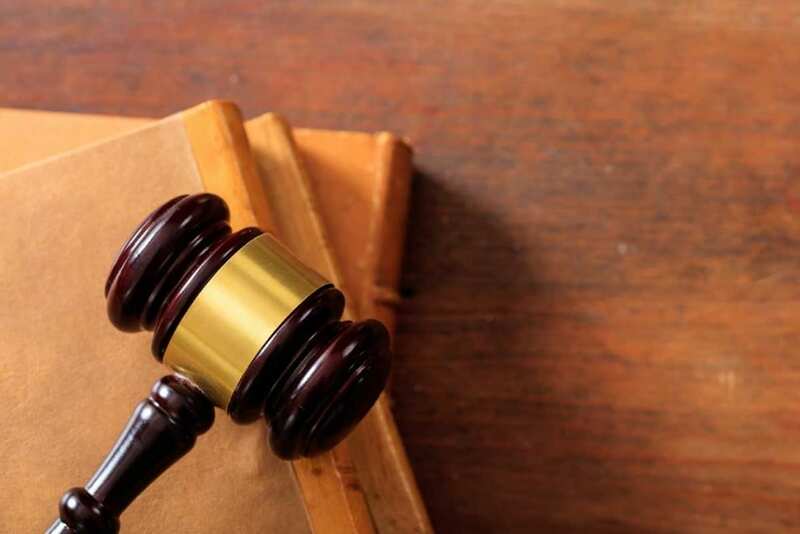 The Court held that “it is totally disproportionate for [the employer] to view [the employee’s] conduct as support for termination with cause” and held the employee was entitled to the enforcement of the settlement agreement with the employer. In coming to its judgment, the Court noted that the employee’s selling of discounted Wonderland tickets was unpaid and not normally a role assigned to her position, the employee intended on repaying the amount owed, the money related to the tickets was not the employer’s property, and the employee lacked intent to steal. This case highlights the high threshold required before an employer can be successful in proving a causal termination. This case is also important for employees in that it is just one example of an issue that can arise following the execution of a settlement package. It is incumbent for both employers and employees to know their options and the potential risks prior to executing settlement documents and what steps may need to be taken should new information become available. 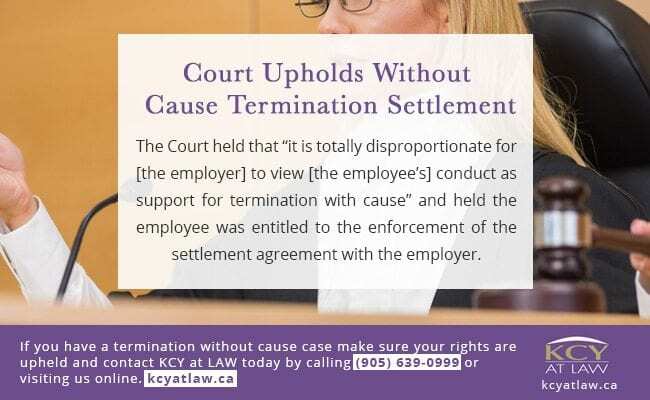 We have the termination without cause expertise to help you with any case relating to employment law so call KCY at LAW today at (905) 639-0999 or contact us online to schedule a consultation!